Before now I would have told these users that they would have to use complicated and expensive mapping software. 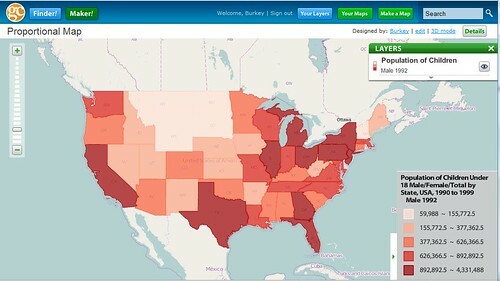 This would allow users to combine spreadsheet data with the desired shapes that they want to view on their map. I am now happy to announce that with GeoCommons you no longer have to rely on the ways of the past. Now FortiusOne has created the new feature of GeoJoin which allows you to move beyond points and easily visualize regions. Below is a walk-through of the process or click this link to view a video that will visually assist you. Continue reading at Fortius One . . . This entry was posted on Tuesday, February 23rd, 2010 at 7:00 am	and is filed under Election, General, Geography, Google Map Mashup, Interactive, Mapping, Mashup, Promote. You can follow any responses to this entry through the RSS 2.0 feed. Both comments and pings are currently closed.